Fiction – paperback; Faber and Faber; 624 pages; 2005. At last. A book by an Australian novelist that isn’t about convicts or the pioneers or soldiers heading off to the Great War. This one is, in fact, set in modern times — or the economic rationalistic 1990s anyway. What’s more it’s set in the Australian city I know best — Melbourne — at a time when I was a resident. How wonderful to recognise names and places in the pages of this well-crafted novel: I have downed many an ice-cold beer at The Esplanade Hotel, drooled over the cakes that line the bakeries along St Kilda’s Acland Street, gone shopping (for books!) in Chapel Street, admired the mansions in Toorak, seen the beach at the end of Glenhuntly Road, walked along the streets of Sorrento. American readers, British readers will not understand this, because they are collectively spoilt by so many modern novels set in their homelands. But for me, as an Australian, I can’t tell you how refreshing it was to recognise such places in the pages of a book that wasn’t non-fiction. It made the story all that more real, and all that more special, to me. Seven Types of Ambiguity — if you have got past my rambling purple-prosed introduction — is described on the blurb as a “tale of obsessive love” but I think that’s too simplistic a summary. It’s about an unemployed teacher briefly abducting Sam, the seven-year-old son of an ex-girlfriend, and the consequences of that one misguided incident and how it impacts on so many different lives in so many different ways. It’s also a psychological thriller, a court room drama, a romance, a satire, an insightful commentary on modern day existence, morals and values, and a kind of literary juggernaut that borrows the title of a well known non-fiction book by William Empson on literary criticism. Throw in politics, big business and prostitution and pretty much every genre and theme is covered here. You certainly can’t complain about its breadth of scope. The tale is told from seven different perspectives: Simon Heywood, the kidnapper; Dr Alex Klima, the psychiatrist who treats Simon but crosses a professional line to become his patient’s best friend; Anna Geraghty, Simon’s ex-girlfriend and mother of the kidnapped child; Joe Geraghty, Anna’s stockbroker husband; Angelique, the prostitute who is Simon’s current girlfriend and through some weird coincidence is also linked to Joe, one of her clients; Dennis Mitchell, an analyst and colleague of Joe’s, who later hooks up with Angelique (are you following me? ); and Rachael Klima, Alex’s daughter, who, through another weird coincidence, becomes Sam’s girlfriend. Strangely enough the only person who does not narrate his side of the story is Sam, the central figure of the book. 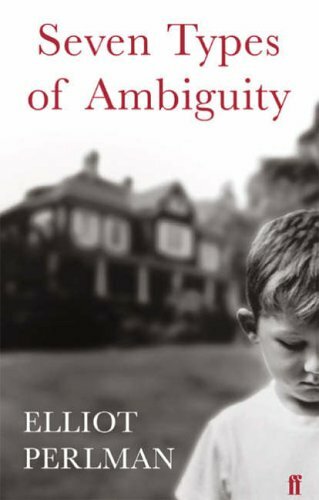 As one would expect from the novel’s title, the theme of ambiguity is a constant. Indeed Perlman plays many literary tricks so that upon reading each new part it takes two or three pages for the reader to figure out who the new narrator is. I initially found this annoying, but I grew to like the surprise — I could never guess correctly no matter how much I thought I understood the characters. Perlman also has his characters constantly misunderstand each other in conversation through the use of ambiguous language. For instance, when Anna is called to discuss Sam’s misbehaviour at school as a result of the kidnapping, the teacher treads softly and then completely misunderstands everything Anna says to her. ‘What do you mean, lately?’ I asked the young teacher. Since ‘the troubles’, she had said, not being able to even say the word ‘kidnapping’, so afraid, as the school had informed us in a carefully worded letter, were they of saying anything that might cause us offence and provoke litigation. ‘Pardon me?’ the young teacher asked, completely at a loss. And later, when Anna wants to check whether it is true that Simon once fell in the swimming pool and was rescued from drowning by Simon, who was stalking Anna at the time, her question is misunderstood by her young son. ‘I believe you, Sam,’ I said, giving him a big hug. I didn’t want to release him. The book is littered with many, many more examples — too many to list here — although I had a lot of fun spotting them as I ploughed my way through this weighty book. But the overriding message of Seven Types of Ambiguity is the ambiguity of human relationships and how two people in a relationship can interpret that relationship in entirely different ways through the prism of their own needs, desires and maturity. For instance, we learn early on that Simon is obsessed with Anna, his ex-girlfriend, whom he is stalking. They have not been romantically involved for more than 10 years and yet he is still very much in love with her. It is creepy and skin-crawling stuff. Later, when Anna narrates her part of the story, we get to find out exactly what she thinks of Simon – and let’s just say it wasn’t what I expected. So, perhaps too, Perlman is demonstrating that the reader’s relationship with fictional characters can be ambiguous too. Despite my glowing five-star review, the book isn’t perfect. Sometimes the rehashing of scenes and conversations, albeit as seen from different points of view, grew wearisome. The voice and tone of each character was also remarkably similar, and some of the sentences were confusing and overly clunky. I also had trouble with the first chapter, not quite being able to work out who the narrator was, much less who he was addressing. And, finally, I found that I disliked Simon enormously despite the fact that most of the characters in this book seemed to like him very much. Why? He sounded like a pompous, too-clever-for-his-boots, obsessive, pain in the arse type of guy. That said, I loved this amazing, brilliant and breath-taking book. I read it compulsively in just under a week, no mean feat for me, a slow and plodding reader at the best of times who usually squeezes in a 30 minute session before lights out each evening. But I found the story gripping, the characterisation impressive and the literary ‘acrobatics’ dazzling. More please! Glad you enjoyed it. I am often wary about recommending books – we all have such different tastes, but I thought you’d like this one. The author has relocated to New York, so it will be interesting to see where to next with his fiction. Yes, Julia, I have to thank you for this recommendation. You were the first to tell me about this book, although I’ve since seen it reviewed and discussed on a million other book blogs. I’ve already got my hands on a copy of his first novel, Three Dollars, which I’m looking forward to reading soon. Interesting that he’s moved to New York . . . but I really hope he doesn’t do a Peter Carey and stay there forever! oldvai, yes, more than 600 pages is a lot to digest, but it was worth the effort. Glad you loved this book too. Isabel, I’m not sure this is characteristically ‘Australian’ because it could, indeed, be mistaken for a modern American novel, apart from the name checking. But I do thoroughly recommend it – sure you will love it. 3 Dollars is probably less accomplished then 7 Types, but more honest – by which I mean less of the cleverness for its own sake that occasionally jars. The hero is also far more likeable and the story is a heartfelt protest about 80s economic rationalism that cannot fail to touch a chord. It is also even more Melbourne – enjoy! To suggest that all/most Auustralian novels are about convicts etc is completely ridculous. So many Australian novels today are set in ‘modern times’ and just because you may not have read them, doesn’t mean that all Australian novels fit the stereotype. Infact I would argue that there is has been a conscious push away from those types of books in the last sixty years.. Try: ‘Sixty Lights’ and ‘Dreams of Speaking’ by Gail Jones, Robert Drewe, Richard Flanagan, Murray Bail, Amanda Lohrey, ‘Dead Europe’ by Tsiolkas and Kerry Greenwood. These are just some of the many Australia authors who do not adhere to such silly stereotypes. Kate, you are right – of course not all Australian books are about convicts, but a lot of those that make it onto the best seller list or gain recognition in the UK/USA are not modern books but ones that are set in the past – and when I say past, I mean BEFORE the Second World War. Of my top 10 favourite Australian books most of them fit into the categories I mentioned: convicts, pioneers and the Great War (see this post: http://kimbofo.typepad.com/readingmatters/2005/09/top_10s_novels_.html ). Of course, you also have to remember I haven’t lived in Australia for 8 years, so I miss all the new stuff that gets published but never makes it to the northern hemisphere! I’m not a huge Robert Drewe fan but loved Flanagan’s Gould’s Book of Fish and Bail’s Eucalyptus. I once met Kerry Greenwood, but have never read her crime books – are they any good? I like Kerry Greenwood, although its makes for extremely light reading. I like her bakery detective series. I really like Gail Jones, particularly ‘Sixty Lights’, which is distinctly contemporary although set in the 19th century. Her latest, ‘Dreams of Speaking’ is also quite good. the seven characters themselves describe the seven types of ambiguity that Empson and Heywood emphasize. I felt that each character and each type of ambiguity, as the book described in, were in sync. the book itself ends at an ambiguous note; Klima’s poem. how did everyone else make of it? I didn’t exactly find it completely satisfying as a conclusion, but perhaps it is only because my interpretation does not satisfy my understanding of the story. But in driving home his point, the ambiguity, I believe Perlman nailed it. Oh damn, now I’ll have to read Empson properly. Me and the New/Old Crit are on a headlong collision course. Thanks HJ. Perlman’s 7 Types I admired in a way, yet found rather cold. I didn’t like the way he wrote about Anna either – the pancake stomach just didn’t do it for me. But you have certainly brought it back to me, good review, thank you. And I’m on a blog layout crawl here, Kim – impressed by the sidebar layout here, nifty. Genevieve, I’ve not read Emerson before (too scared!!) but Perlman’s book certainly piqued my interest. Glad you like the sidebar layout — it’s a new and improved version. I used to have a sidebar on the right as well, but it was a pain to navigate and everything just look too cluttered. Seven Types Of Ambiguity has been one of my all time favourite novels since I read it a few years ago. I have since met Mr Perlman as he is (was) local to the bookshop where I work. He’s a lovely, modest man, and I can’t wait until his next book! Kristy, yes, it’s a great book and yes, I’m hanging out to see what he comes up with next. It’s been awhile since this one, so it must be due soon…? kimbofo: I know I am dredging up a four-year-old post here but this novel only recently came to my attention. As a Canadian living in an urban centre (and one who has previously found many good comparisons with Australian fiction), I am intrigued at an urban-style book set in a city where that is not common — it would certainly apply to Calgary where I live. So my question is, almost four years later, does it still live on in memory as a good book? A yes answer will definitely put it on my list. Hi Kevin – did I really read this book 4 years ago? Bloody hell; where does the time go? But to answer your question; yes, it lives on in the memory (quite fondly). Its by no means a perfect novel, and the language can be a bit over-done and flowery, but it has an ambitious scope. I suspect it might be a book that dates quite quickly, though. Be interested in your take on it if you do decide to read it. I intend to include it in my next order. Like you, I am interested in books that capture cities — London, New York and Los Angeles being the big three. The story and format you describe are interesting but I’m even more intrigued by the setting. Thanks for the thoughts.